Due to high pre-ticket sales, Laughter on the 23rd Floor at North Coast Repertory Theatre will extend performances through Nov. 20th. 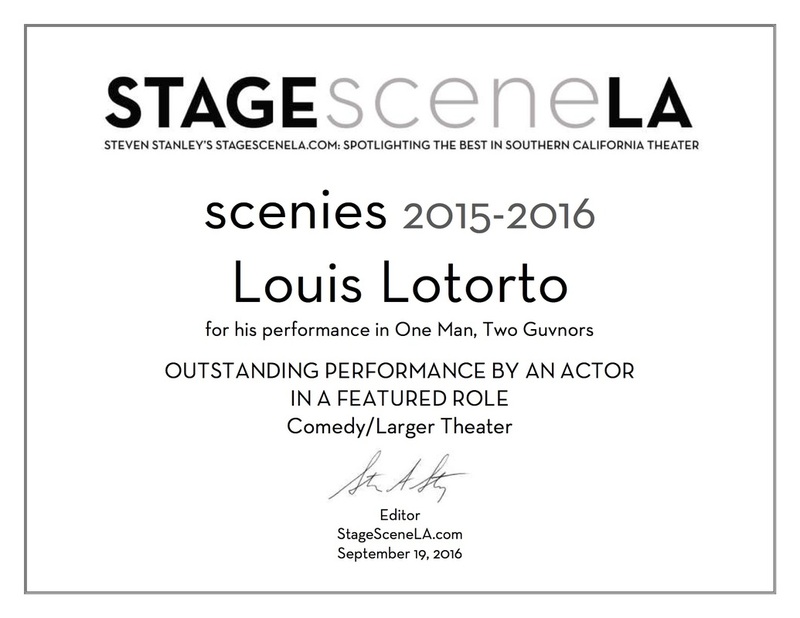 Louis was the recipient of 2 LA Scenie Awards from critic Steven Stanley for One Man, Two Guvnors at South Coast Repertory Theatre: BEST ENSEMBLE & BEST FEATURED ACTOR in a comedy! Louis will be playing Milt in the North Coast Repertory Theatre's production of Neil Simon's Laughter on the 23rd Floor, directed by Tom Markus. ​From the gifted pen of America’s favorite playwright, Neil Simon, comes one of his funniest plays; a love letter to his early career as a writer for Sid Caesar’s “Your Show of Shows”. Simon recounts his writing, fighting and wacky antics during days of live television when he cavorted with such comedy legends as Carl Reiner and Mel Brooks. You’ll see why The New York Times hailed LAUGHTER as “one of Simon’s best, most enduring and endearing plays”. Louis will be playing Venticello #2 in his sixth production of AMADEUS, this time at South Coast Repertory Theatre from May 6th - June 5th, directed by Kent Nicholson. Winner of seven Tony Awards, including Best Play, and winner of the Academy Award for Best Picture in 1985. 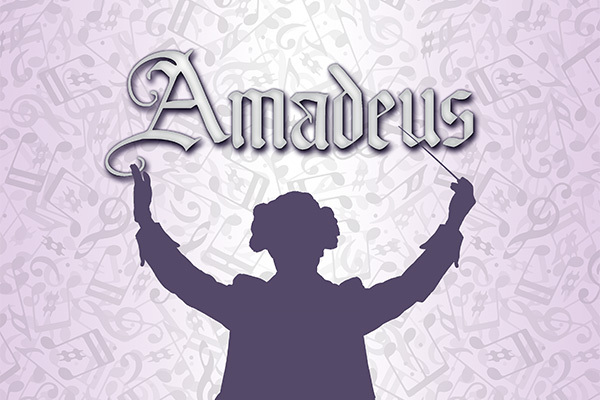 Called “triumphant” by The New York Times, Amadeus is a highly theatrical, thrilling and humorous tale of an artist of average talent living in the shadow of a genius. Gleeful critics have cheered from London (“deliriously daft and diabolically joke-stuffed”— Independent) to New York (“splendidly silly”--The New York Times) over this delicious farce set in swinging ’60s Brighton. Francis, a failed washboard player with an insatiable appetite, finds himself in the employ of both Roscoe, who is really his own twin sister (in disguise), and Stanley, a well-bred twit (who actually killed the real Roscoe). And that’s only the beginning! In this adaptation of The Servant of Two Masters, food flies, pants drop and madness abounds, to the tunes of a live band (minus its washboard). The Tony Award-Winning Broadway Hit! With lightning quick costume changes, a cast of 4 plays over 140 characters in this fast-paced farce that owes as much to Monty Python as it does to Hitchcock. Louis will be playing Leo in NorthCoast Repertory Theatre's production of Chapter Two by Neil Simon, Feb. 25th through March 29th, 2015. Back by popular demand, Chapter Two is the first play ever produced by North Coast Rep. Based on events in Simon’s life, this charming comedy revolves around the recently widowed George and his neighbor, the recently divorced Jennie. Their journey of meeting, dating and forming a relationship is laced with Neil Simon’s golden touch. 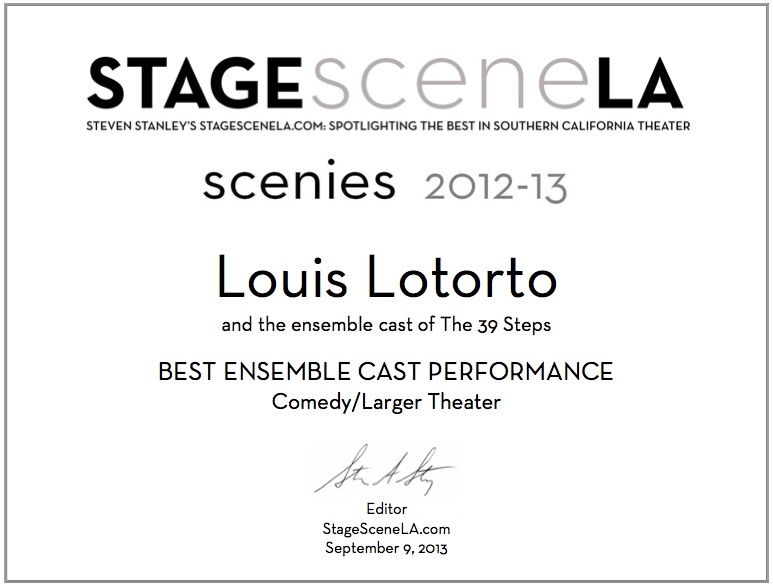 Louis won the Desert Star Award for Best Supporting Actor/Comedy for his portrayal of one of the Clowns in The 39 Steps at Coyote StageWorks in Palm Springs. Clink this link to read the full story. Louis will be joining the cast of Ensemble Theatre Company's production of Amadeus, as one of the Venticelli. ﻿Louis will be joining the cast of The Magic Finger by Roald Dahl for MainStreet Theatre. The 39 Steps has opened to RAVE REVIEWS!!! Click here to follow the links to read them and make your reservations before we close at The Norris Theatre in Palos Verdes on Feb. 9th. Next stop: Palm Springs at the Annenberg theatre at Coyote Stage Works. Hope to see ya there!! Louis will be once again donning wigs, accents and a multitude of mustaches as Clown #1 in the uproarious play, The 39 Steps, this time a co-production between the Norris Theatre in Palos Verdes(Jan. 24th - Feb. 9th) and Coyote StageWorks in Palm Springs(Feb 28th - March 8th) Click the image for tickets and more information for the Palos Verdes dates. Click here to visit Coyotestageworks.org for tickets and more information for the Palm Springs dates. Louis was nominated for BEST LEAD ACTOR in the role of Robert in S.R.T. 's Don't Dress For Dinner for BroadwayWorld.com's San Francisco Awards for local theatre in the Bay Area. Winners will be announced in January of 2014. If you would like to vote for Louis to win, click here to help his chances! 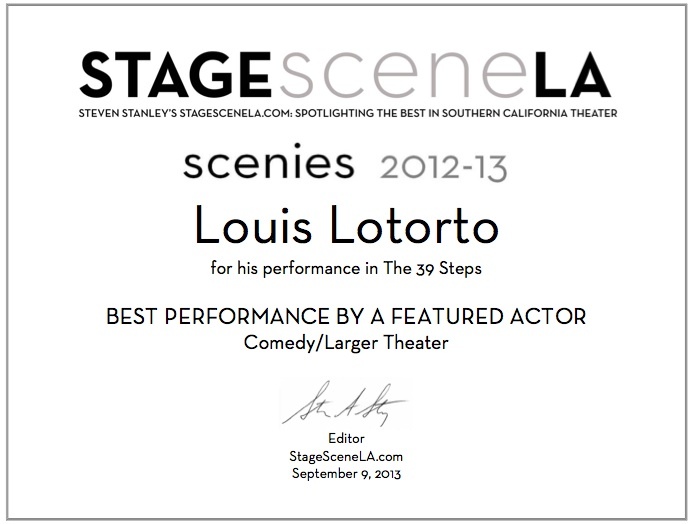 Louis was the recipient of 2 LA Scenie Awards from critic Steven Stanley for The 39 Steps at Glendale Center Theatre: BEST ENSEMBLE & BEST FEATURED ACTOR in a comedy! The production also garnered an award for BEST COMEDY and BEST DIRECTION by Todd Nielsen. Critic's Pick!!! The 39 Steps. Read the review here. Louis will be starring as Robert in Don't Dress For Dinner at Sierra Repertory Theatre in Sonora, Ca directed by Peter DeBono. For tickets and dates, click the image below to link to the theatre's website. The first review is in! Read Stage Scene LA's review here. Louis will be playing Clown #1 in The 39 Steps at Glendale Centre Theatre directed by Todd Nielsen. For tickets and dates, click the image for the theatre's website. Rehearsals start for The Odd Couple, directed by Andy Barnicle at North Coast Repertory Theatre. For more information and reservations, please click HERE. "There is scarcely a moment that is not hilarious." "Richly hilarious and remarkably original. Wildly, irresistibly, incredibly and continuously funny." In this Tony Award-winning comic masterpiece, Neil Simon created two of the most memorable characters in the history of Broadway and broadcast television: Oscar Madison and Felix Unger. Discover the genius of the original play that has become a high water mark that is strived for by comedy writers to this day. The reviews are in for Blame It On Beckett by John Morogiello at the Colony Theatre in Burbank and they are all raves including BackStage's CRITICS PICK! and L.A. Weekly's PICK OF THE WEEK! Click here to see what they have to say. 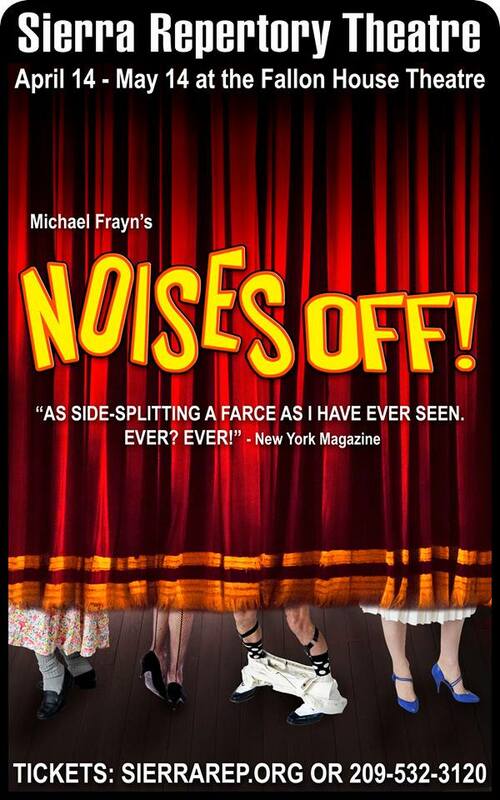 . .
Louis will be playing Lloyd in the upcoming Norris Center production of Noises Off, directed by James Gruessing. For more information and for reservations, click HERE. Called the funniest farce ever written, Noises Off presents a manic menagerie as a cast of itinerant actors rehearsing a flop called NOTHING'S ON. Doors slamming, on- and backstage intrigue, and an errant herring all figure in the plot of this hilarious and classically comic play. "The most dexterously realized comedy ever about putting on a comedy. A spectacularly funny, peerless backstage farce. This dizzy, well-known romp is festival of delirium." Louis will be playing Jim Foley in the upcoming Colony Theatre production of Blame It On Beckett, directed by Andy Barnicle. For more information and for reservations, click HERE. What really goes on behind the scenes in non-profit theatre? Meet Jim Foley, a jaded, cynical Literary Manager with a penchant for caffeine and chaos. Into Jim's derelict lair steps Heidi Bishop, a bright-eyed, newly minted MBA who hopes to make the leap from box office to back office. At first she seems like Mary Poppins, but it turns out Eve Harrington would be more like it, as Heidi manipulates everyone around her to get what she wants. A wonderful comedy with heart and a message, the play asks the question how far are we willing to sacrifice our soul to get ahead? And once we do, is it worth it? THE STORY, an audio bible I recorded last year in which I supplied the voice of Jesus, was just honored with a 2012 Audie Award. The Audie Awards, hosted by the Audio Publishers Association, are the most prestigious honor in the audio book industry. Louis just finished an extended run of The 39 Steps at Ensemble Theatre in Santa Barbara. It was the highest ticket selling show in the theatre's history! - Santa Barbara Independent Click here to read the full review. Louis will be playing Clown #2 in the upcoming production of The 39 Steps at the Ensemble Theatre Company of Santa Barbara. Click here for more information and reservations. The Tony Award-winning hit Broadway comedy . Richard Hannay, a debonair gentleman, is at a London theatre, when a fight breaks out and shots are fired. In the ensuing panic, he finds himself holding the hand of the frightened Annabella, a spy who tells him that she has uncovered a plot to steal vital military secrets by an espionage organization called the "39 Steps". The next morning, when she turns up dead, he finds himself on the run. With lightning quick costume changes, a cast of 4 plays over 140 characters in this fast-paced farce that owes as much to Monty Python as it does to Hitchcock. READ a review of THE LADIES MAN in the Sierra Lodestar. READ a review of THE LADIES MAN in the Union Democrat. READ a promotional article about THE LADIES MAN from the Stockton Record. Louis will be playing Etienne in the upcoming production of THE LADIES MAN for S.R.T. in Sonora, Ca. Click here for more information and reservations. Delight in the delirious madness of Feydeau’s first hit, newly adapted by Charles Morey. In Belle Époque Paris, the recently married Dr. Hercule Molineaux tells "one, tiny, little, hardly noticeable lie" to cover an innocent but embarrassing indiscretion. From that single untruth tumbles a cascade of increasingly convoluted deceptions, misunderstandings and mistaken identities, all adding up to a hilariously zany and charming farce. “…an explosion of inspired craziness…I can't recall the last time I laughed so hard…" —Wall Street Journal. "This shaggy poodle story…is Feydeau at his silliest." Louis will be directing as well as playing Dorian in OPUS at the Aspen Fringe Festival in June. Click here for more information. Based on a true incident, Opus follows the fictional account of the world-renowned Lazara String Quartet, struggling to prepare for their highest-profile performance of their career with an attempt of resurrecting Beethoven's notorious op. 131. But the sudden disappearance of their brilliant but unstable violist, and the quick hiring of a gifted but inexperienced replacement, strikes dischord as passions rise, personalities clash, secrets are exposed and they are forced to confront the ephemeral nature of their life's work. Will this be their last Opus? Click here to read a review of THE RAINMAKER. Click here to read an interview about Louis and THE RAINMAKER from the Stockton Record. Louis will be playing Starbuck in the upcoming production of THE RAINMAKER in Columbia, Ca at the historic Fallon House Theatre for S.R.T. Click here for more information and reservations. A behind the scenes look at OPUS, playing at Ensemble Theatre of Santa Barbara through Feb. 27th, 2011. Click here for more information and for reservations. Louis will be playing the role of Dorian in the upcoming production of OPUS at the Ensemble Theatre Company of Santa Barbara. Click here for more information and for reservations. A play with heat, humor and histrionics. Louis will be playing Ariel in the upcoming developmental production of THE TEMPEST at the Rubicon Theatre in Ventura, CA. Performances will be Oct. 12 - 24th, 2010. Click here for more information and for reservations.